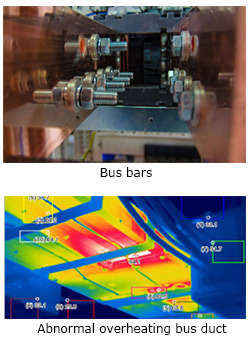 "Improved Detection of Bus Bar Overheating"
Bus bars are uninsulated strips of a highly conductive metal such as copper or aluminum. As they have lower electrical resistance than insulated power cables, they can carry large electrical currents and are thus suitable for use in power distributions systems in power plants, substations, factories, and data centers. Bus bars are also used in power distribution boards. Bus bars offer great flexibility as they are made of highly malleable metals that can be easily shaped to suit any number of facility layouts. Bus bars are bolted, clamped, or welded to each other and to other apparatuses. If a bolt or clamp comes lose or a welded joint fails, abnormal heating may occur at that location due to an increase in the electrical resistance. The overheating further increases the electrical resistance and can lead to a burnout or even a fire. In order to prevent overheating at any of the bus connections, the connections should be inspected on a regular basis. However, as the bus bars are often inside plastic or metal bus ducts and covers, and are often in difficult to access locations, visual inspection can be difficult. The burning out of a power supply bus bar is a threat to plant safety and can lead to an unplanned shutdown of plant operations. To eliminate such risks and avoid the huge costs of lost production, it is vital to quickly detect and immediately respond to any indication of overheating in a power bus bar. Burnouts in a power bus bar can be prevented by quickly and accurately detecting abnormal rises in temperature and locating the hot spots. As bus bars are surrounded by strong electric fields, conventional electric sensors such as thermocouple thermometers are not suitable for this purpose. Bus bars also sometimes follow complicated paths through plant structures and other types of buildings and may have a number of blind spots that cannot be readily imaged using thermal imaging cameras. The Yokogawa DTSX is a unique and innovative temperature monitoring solution that uses an optical fiber cable as a temperature sensor. Since the sensor is not affected by electromagnetic noise, the DTSX is able to monitor distribution of temperature in units of 1 meter accuracy under a strong electric field. By quickly detecting overheating and pinpointing the location of a hotspot, the DTSX ensures that any problem can be responded to immediately, before it leads to a costly and expensive plant shutdown. 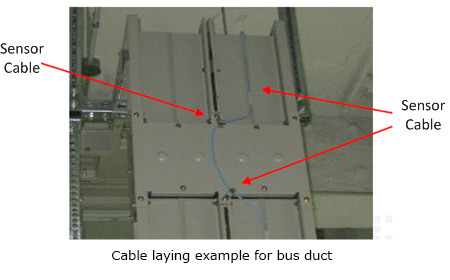 The optical fiber cable can be installed directly on a bus bar and on the surface of a bus duct or cover. Thanks to its ability to continuously detect abnormal rises in temperature and pinpoint hot spots even when a bus bar is located inside a bus duct, the DTSX is also useful in maintenance applications such as locating bolts that need to be tightened. Using pulses of laser light beamed through an optical fiber cable, the DTSX is able to detect temperature-dependent variations in signal frequency that are the result of a phenomenon known as Raman scattering that occurs along the entire length of the optical fiber cable, and it also can determine the locations of those temperature readings using light that is bounced back (backscattering) to the source. By measuring how long it takes light to make a round trip back to the source (backscattering), the DTSX is able to calculate the location for each temperature reading. Abnormalities can be located with a spatial resolution of just one meter. The DTSX200 is a short range, low sampling resolution capable product, with a measurement range of up to 6km, temperature accuracy of 0.1 °C, and a 19" rack design. The DTSX3000 is the long range, high accuracy product, with a measurement range of up to 50km, a temperature accuracy of 0.01 °C, and 19" rack design. Yokogawa’s DTSX solution ensures a safe work environment and total insight into the process being measured and provides a complete, simple and cost-effective solution to complex temperature measurements.